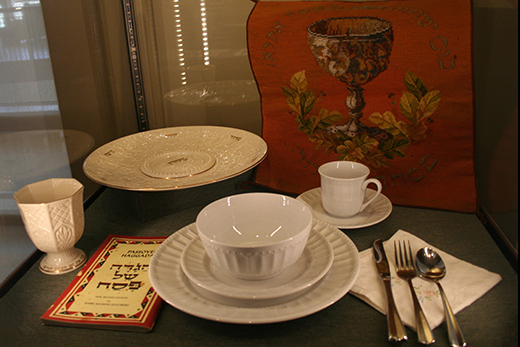 Candler’s Pitts Theology Library has launched a new exhibit, “Reading the Telling: The Passover Haggadah Across Time and Place," highlighting the Haggadah (pl. Haggadot), a compilation of biblical passages, prayers, hymns and rabbinic literature that is read each year during the Jewish Passover Seder. The exhibit, which opened March 7, will run through June 30 in the Pitts Exhibit Gallery. The exhibit is open during regular library hours, with a lecture event on April 3 and opportunities for guided tours in April and May. Learn more. A collaboration between Pitts and Emory’s Tam Institute of Jewish Studies, the exhibit is curated by Adam T. Strater, a Wexner Graduate Fellow and PhD student in Hebrew Bible in Emory’s Graduate Division of Religion. It includes various Haggadot from 1695 to the present, acquired from the collections of Pitts, Emory’s Rose Library and the William Breman Jewish Heritage Museum in Atlanta. There are thousands of versions of the Haggadah throughout the world, as each “telling” can be customized to reflect the context of the community observing the Seder. The Pitts exhibit highlights this variety. "The Freedom Seder" (1969), which reached out to African-Americans after the assassination of Martin Luther King Jr.
With nearly 700 volumes, Pitts boasts one of the largest collections of Haggadot in the southern U.S. The bulk of the collection formed in 2007 and 2008, with gifts from the personal libraries of Jewish social worker Richard K. Goldstein, who donated 579 volumes, and Rabbi David Geffen 59C, author of "American Heritage Haggadah," who donated 99 volumes. Admission to the exhibit is free. Guided tours will be offered on April 1, 15, and 29 and May 13. Register for a tour. The public is also invited to an opening reception and lecture by Strater, the curator, on Sunday, April 3, from 2 -4 p.m.